Titanflex has been constantly evolving in technique and design for more than 20 years. In that sense, the brand has been faithful to this modern and diaphanous collection. Purists models outstand due to its outgoing and wide temples and technical innovation. The Titanflex brand is synonymous with superior memory metal technology and high quality materials, at an affordable price point. 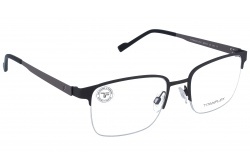 All frames are super flexible at the bridge and temple, ultra lightweight, and less breakable than traditional frames. The collections are performance and style driven, to address the needs of every man who appreciates comfort, quality, and technology. A variety of styling is offered: from classic to contemporary, from minimal to complex, and from sophisticated to sporty.